its super simple (and CHEAP!). super nice thing is that you can block the signal with your hand (mirrors? lenses?) this is real cool for my project, as this means that you can jam musical data coming from one unit to another. jam as in trash / mash up. also one unit will interfere with another. yeah: data chaos! // Toggle OC1A and OC1B on Compare Match. I wonder if you can program an Arduino that way.. Hmm..
That is a nice trick. How far apart can you get it before the communication gets garbled? that depends on the IR LEDs really. i haven’t tried it over greater distances, but my guess would be that with clear line of sight and not too much sun light / interference, you could reach pretty long distances. You can get great(100+ meters) range if you use the right protocol and lenses, just look at some of the DIY Lasertag stuff. Any chances of higher resolution pictures? hm… i took these pictures with my phone while doing the prototyping…. so i’m not sure if higher resolution will give you a lot more info… are you looking for something special on the photos? connections? Definitely I will try this. I can see applications for this in swarm robotics. A secondary fail-safe communication, passing data from one to another if other methods fail. wireless data trasmission using robot which measure temperature and send data to recevier & it display on LCD. the carrier at 38KHz in arduino? How about using lasers instead for long distance line of sight communications? You could use lasers, but as jremin said you might have issues with accuracy. However, I wonder if you used a laser to illumate something like a ping pong ball or diffued target, that way you have some leeway. I tried to use it but I have some strange behavior. Do you know if the values you put in registers to generate 38 KHz are linked to the frequency of the micro-controller. I currently use use an Arduino with the 20MHz 328. Are the values used here for a 20MHz or a 16MHz clock? This is cool! I’d like to use this in a lasertag project, is that alright with you? What license is your code under? please send a link when you have done your laser tag project. and have fun! how about to change uart baudrate to 9600? is it work? I used baudrate 2400 with delay time 500ms but the data still loose, any suggestion? i am unsure of this myself…. Hi This is really great. But i have tried this. It does not work. So i have some questions? For TX, how does the IR LED connect to arduino? the +leg of IR LED to arduino pin 9 and the other leg to arduino pin TX? And for RX, in the code, what does the pin 13 do? the three legs of the sensor are connected to the arduino +5v, gnd,and pin RX? How can I change pin9,10 to pin5,6? How do you make an Ir-Led array. I mean amplify this circui, can anyone hansome posting the schematic? I’ve liked it very much. But I haven’t understood how is the positive pin of the LED connected to the board. Is the red wire only plugged to the pin 9, only to the pin 10, to both or in another way? ah! great! thank you hexagon! How much current draws your ir led? All types i saw had at 50mA – 100mA. Wouldn’t it be better to use a transistor. Even to get a better range. no 100mA should be OK. as far as i know the atmega can handle up to 200mA on each pin. Thanks, for your answer, but 200mA is much to much. But I think that I found the solution. The resistor tweaks the power consumption of the LED. Without the resistor you might toast the LED -and the Arduino. If the LED needs 1.3V (see LED Datasheet) and you want only 20mA on your Arduino pin, the equation should be (5V-1,3V) / 0,02A = 185 Ohms. The resistor reduces the IR output. A transistor is only needed when the LED gets to weak for the task. I’ll try out how it works and post the result. Ok, hacking means also to go beyond datasheets. – But I it is also annoying when your exhibition ends in a soldering performance…. Hi there, nice demonstration. I’m trying to figure out the receiving side…exactly what kind of IR receiver did you use? And is it a phototransitor or a photodarlington? I am sorry for my rough english, it was not my intention to complain or something. It thing it is very cool when people share their knowledge instead of making secrets out of it. And I finally checked the Atmel datasheet : 40mA is the max current for a single I/O pin. 200 mA is the current for the vcc and the gnd pins. The consumption of the 328 chip is 12mA. If all 14 I/O pins are used for output: (200-12) / 14 = 13,4 mA on each pin. -but I think, that these are absolute save conditions. So I use now a 220ohm resistor and it the LED works with 18 mA. Where do I connect pin to generate 38kHz?? Pin 9 or Pin 10? it’s been a while since i used this setup, but i think both pins will send 38kHz. try it out 😉 check with a scope, or just connect the IR LED and see which work. Thank you for so kind anwers. 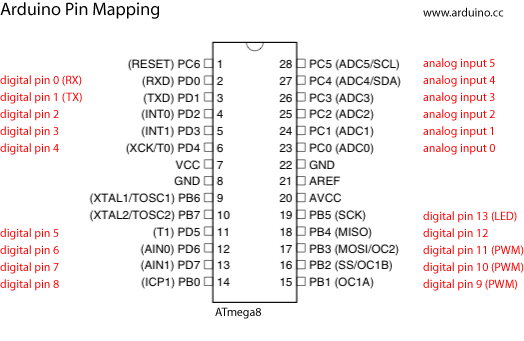 Is your test board atmega 168(Decimilla)? i want to send a string from a arduino to the other. Iam not getting in the same order as transmitted. My receiver receives some garbage values. How to avoid this? i am sorry genn / jer12, you have to be more specific if i am to help you. debugging is tricky and needs precise information. I am still confuse in transmitter schematic, where is the ground position…? Thanks jremin, it works perfectly. I se you use the pin 9 and 10 for the 38KHz, but is the pin 9 and 10 not for the 16MHz XTAL? is that because its a Arduino where there are some preprogram in it? sorry for the question, but get confused because im new with Arduino. Hi, i just see “ÿÿÿÿÿÿÿÿÿÿÿÿÿÿÿÿÿÿÿ” someone can help me? sound like you are using the wrong baud rate in your serial monitor? Can you make the RX code to flash an led when its receiving “testing testing testing” ? sure. just add an LED to the receiving circuit. look at basic arduino to tutorials on how to flash LEDs. Pleased to have found this. The first thing anyone asks when they see one of my RC Projects is ‘How small can you make it ?’ and the truth is at least half the size is due to the user interface – buttons, pots, leds etc. The text here is hard coded. I am trying to accept text from the serial monitor and send that across. But im not receiving even a bit. i am sorry i don’t understand what you mean?